This pool, which was designed by the owners of the home to suit their lavish riverside property, is undoubtedly the most innovative pool in Quality Dolphin Pools’ impressive portfolio. 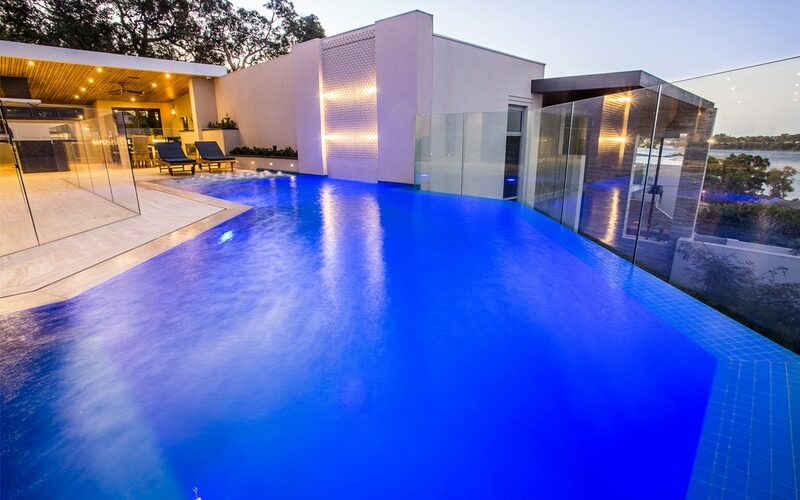 Constructed 350mm off the boundary of the property and with a retaining wall height of 4.3 metres, this pool is a testament to the company’s remarkable workmanship. 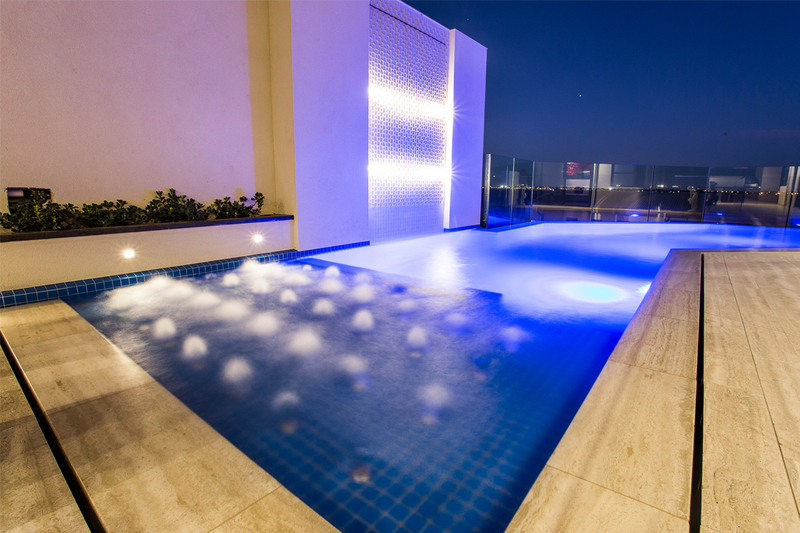 The top of the pool is constructed with a vanishing-edge that is 1.9 metres above the retaining wall, which gives depth from the top of the pool, all the way down to the neighbour’s driveway. The pool has extensive piling that goes down to the base of the retaining wall, and then a section of retaining wall was excavated and filled up with concrete. Built on top of 300mm civility filled piles, the pool base is suspended above the retaining wall, which creates a truly impressive visual. The pool’s jaw-dropping wet deck has a separate line running to a balance tank located in the basement of the home. The vanishing-edge is another remarkable feature, which includes a 350mm stainless steel trough to ensure it does not encroach over the boundary. Tiled in striking jubilee crystal blue 47mm tiles, the pool also has a water feature that creates a fantastic ambience year-round. 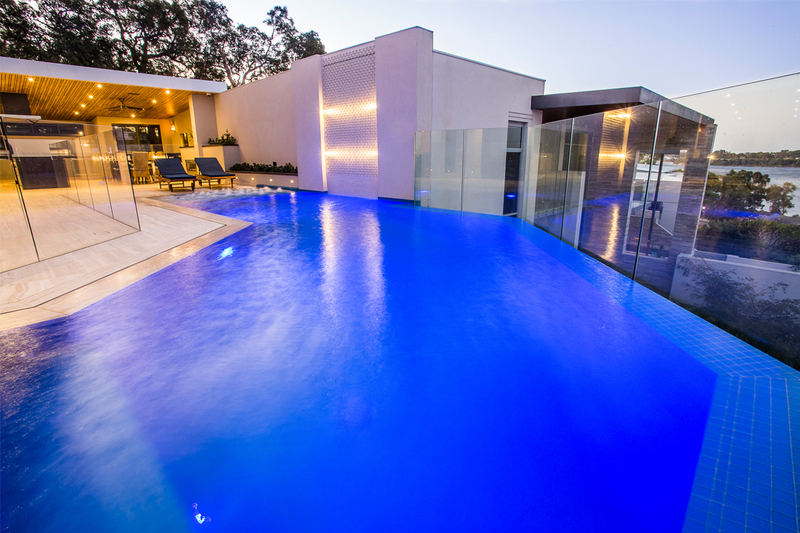 Complete with top quality technology, the pool includes a PC 2000 in-floor cleaning system, a Waterco 800 sand filter, a Pentair variable speed pump, a Jandy control system to run off the home’s CBUS system, a Chemigem pool chlorinator, air bed blowers, LED lighting and a Robo heating system. Established in 1971, Quality Dolphin Pools is a family-owned and -operated concrete swimming pool and restoration company based in Perth. The team has been designing, constructing and restoring quality concrete swimming pools for more than 44 years, and prides itself on its meticulous attention to detail, honesty, reliability and commitment to excellent workmanship. 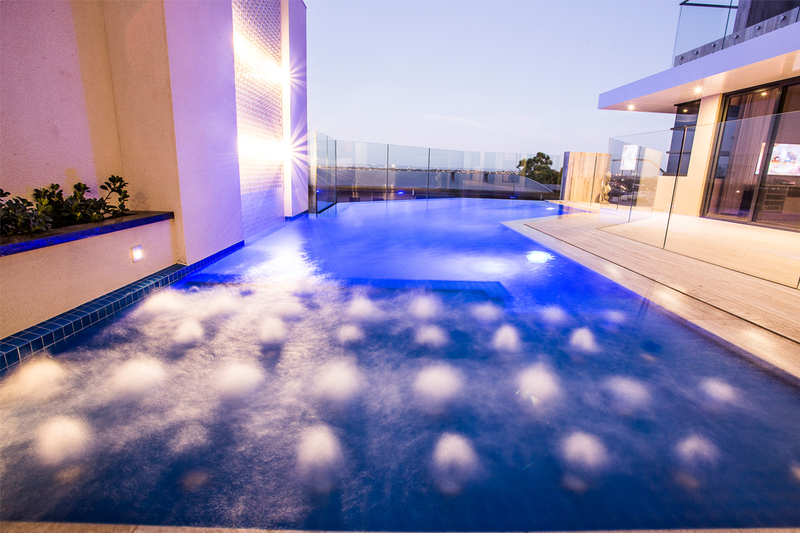 Quality Dolphin Pools has established itself as one of the most highly respected swimming pool companies in Western Australia, and has won several industry awards, including the Swimming Pool and Spa Association (SPASA) WA Pool of the Year in 2011, 2013, 2014 and 2015.